Basting rabbit with a spiced honey glaze while it slowly turns on the rotisserie is one of my favorite ways to cook cottontail in the Summer. Heat water until just below boiling point. Add Kosher salt and sugar and stir to dissolve. Place rabbit in a large container with a lid. Poured cold brine over rabbit, cover, and refrigerate, overnight. An Hour Ahead, heat the honey, peppercorns, allspice and star anise over medium heat for about 5 minutes. Leave the honey steep for an hour. An hour ahead, remove the rabbit from the fridge and bring to room temperature. Bring the hind quarters and front legs together to face each other towards the middle of the stomach cavity. Tie the rabbit tightly with kitchen twine. Turn on the rotisserie/infra red burner. Attach the rotisserie rod to the rabbit by piercing the rabbit cavity through one end and coming out the other end. Use the prongs at the end of the rod and slide them into each end. Secure with more twine if needed to keep the rabbit from sliding as the rotisserie spins. 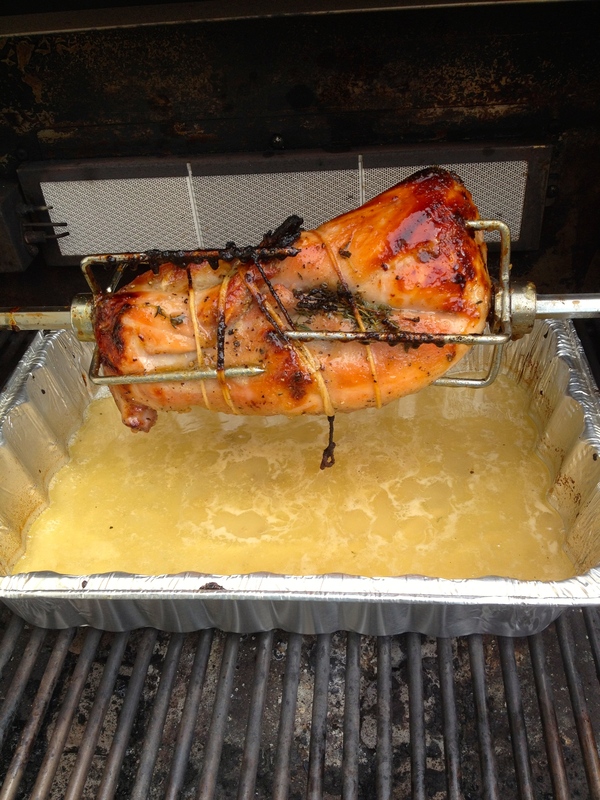 Place a foil pan under the rabbit to catch drippings. Once the 15 minutes is up, begin basting the rabbit every 5 minutes. Continue cooking the rabbit for about 45 minutes (it may take longer based on the size of the rabbit). **If beef caul fat (aka lace fat) is available wrap the cottontail in 3 layers of it to keep the rabbit moist as it cooks. I served the cottontail with spaetzle boiled in chicken stock then sautéed in browned butter and seasoned with salt, pepper, and onion powder.